A greater fluidity in social relations and hierarchies was experienced across Europe in the early modern period, a consequence of the major political and religious upheavals of the sixteenth and seventeenth centuries. At the same time, the universities of Europe became increasingly orientated towards serving the territorial state, guided by a humanistic approach to learning which stressed its social and political utility. It was in these contexts that the notion of the scholar as a distinct social category gained a foothold and the status of the scholarly group as a social elite was firmly established. University scholars demonstrated a great energy when characterizing themselves socially as learned men. 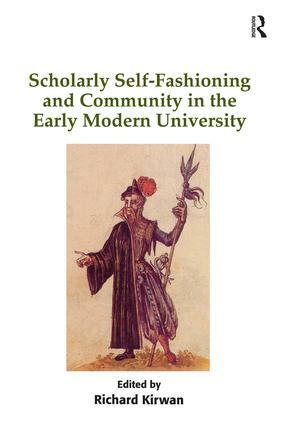 This book investigates the significance and implications of academic self-fashioning throughout Europe in the early modern period. It describes a general and growing deliberation in the fashioning of individual, communal and categorical academic identity in this period. It explores the reasons for this growing self-consciousness among scholars, and the effects of its expression - social and political, desired and real. Richard Kirwan is a Lecturer in History at the University of Limerick. His main research interests lie in the social and cultural history of early modern universities, early modern elites, and print culture. His first monograph, Empowerment and Representation at the University in Early Modern Germany: Helmstedt and WÃ¼rzburg, 1576-1634, was published by Harrassowitz in Kommission in 2009.